Mechanical properties of anatase TiO2 containing point defects have been investigated by using first-principles with the software package CASTEP of Material Studio. 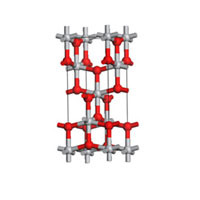 Four types of point defects including Ti vacancy, O vacancy, Ti interstitial and O interstitial defects are introduced into anatase TiO2 and the lattice constants, elastic constant, bulk modulus and shear modulus of anatase TiO2 are calculated, respectively. The effects of point defects on the mechanical properties of anatase TiO2 are discussed.